The Growler weekend came and went fast, but not without a bunch of suffering from 700 Racers. The weather was beautiful and the singletrack was in great shape…until the end. Check out my race report at Griggs Orthopedic Website. Check out the results here at Gunnison Trails Website. 2013 Kokopelli Trail Ride Report. My unconventional race schedule this summer has turned into more then I could have ever imagined. Since the Arizona Trail Race, I have not really done much of anything, a few rides here and there but mainly just some R&R, and it’s been great. This past Saturday at 12:30am (Friday Night) me and only a hand full of others set out for the rugged Kokopelli Trail. I set a goal of 15 hours. This was just a number I threw out there, not really knowing how fast I could do it. Last fall Mike Behrendt and myself rode the trail from Loma to Moab in 48 hours, camping and relaxing. This time I would start from Moab, Utah and end at the Kokopelli Trailhead in Loma, Colorado. Check Out 2pedal.com for the Kokopelli Trail Guide Book. My girlfriend Lindsay, our friend Kristi, and myself arrived in Moab at around 8:00pm. I wanted to get some food, pack my gear and get a quick nap in before the odd 12:30am start time. The day before I changed out my Maxxis Icons for a more fresh pair. I have never had problems with my tubeless tires but the unknown spirits above figured it was a good time to. Something had gone wrong with my valve stem. I tightened down the circle screw where the valve meets the rim. Usually the Stan’s No Tubes Sealant will fill that gap and it did momentarily, but not for long as air continued to escape near the valve. I packed my stuff up and tried to take a nap in a very party friendly campsite. I gave myself and hour and a half to nap, I slept maybe 10 minutes. I got out of the tent, got changed, and hit the road where I would meet 3 others at the town park in Moab. Peter Basinger (who slayed this years AZT 300) and two others. The four of us slowly climbed up to the Slickrock Trailhead where the race technically starts. Marshal, another rider, was on route already as he started at 6:00pm on Friday, but we were not sure how many more were already on course. 1:00am hit, signaling the very anti-climatic start. The the start and my setup. I started the climb up Sand Flats Road at a fast pace. I wanted to give myself a cushion if I needed a rest or had mechanical issues. I knew what was ahead from riding the trail last fall but I really didn’t know what to expect riding it from in the opposite direction. The half paved, half gravel climb was roughly 12 miles. It was dark and still relatively warm. After Looking at my GPS I realized I missed my first turn “stupid Neil” I said aloud. I got on track and climbed LPS and UPS (both part of the Porcupine rim trail). After reaching Mountain Loop Road my legs received their first break after the biggest climb of the course. I descended down to Castle Vally Campground where I hit 40 MPH a few times, what a rush! I quickly got back to climbing up Castelton Road. I avoided looking at the time for most of the first section. I knew I needed to keep a good pace. I saw lights in the distance behind me. Was Peter catching me already? I turned my lights off and rode in the dark until I was around the ridge and out of site. As I continued up the paved climb it started to rain. Rain was in the forecast but knew it would be isolated showers. I finally reached Fisher Creek, still with no recollection of time. I stopped at mile 30 and assessed my water situation on the Fisher Creek Bridge. 2 liters plus a full bottle. I was not drinking a lot of water but felt fully hydrated. I continued on without filling up. After pedaling through some classic Moab sand the rain really started to come down. It didn’t last long but it made for a more difficult ride through the sand. The decent down to Onion Creek Road was fast, fun, yet draining. I saw lights in the distance ahead of me, not knowing if it was another rider or not. I continued my decent down to Hideout Campground and noticed the light in a different position. I was now certain it was another rider or a least someone, but truly who would be out in the middle of the night but us. I worried about my rear tire and started to baby it, I could tell it was losing air but I filled it at a higher PSI at the start to over compensate. I finally caught the light at the Hideout Campground(mile 42), it was Cat Morrison filling up on water. She said she had started at 12:00am. We chatted briefly about the race and where we were from. I too filled up on water, and quickly parted ways with Cat. I reached Fisher Valley just as the sun started to illuminate the canyons. This trail has a powerful spiritual feeling about it. The sun rise was beautiful. I reached Rose Garden Hill Road and eventually the legendary hike-a-Bike section. I got to the top and noticed a bikepacker, it was Aaron from Salida. He was bikepacking the trail as an out and back from Loma. We chatted as I de-layered, changed out my sunglasses lenses, and ate my chicken sandwich. I did not stop for long as I figured both Cat and Peter were on my tail. This climb was brutal for me, lots of ledges and loose rock made it difficult. However, it didn’t last long and soon I was cruising down Entrada Bluffs Road where I eventually hit the Dewey Bridge which marked the half way point. I stopped when I saw another biker, it was Marshal. I asked how he was doing, “not good” he said. He had been dealing with stomach issues and throwing up, he said he was finished. We chatted briefly about my pace and I quickly took off again. Just as I got on the Dewey Bridge, I looked down at my tire, it was nearly flat. This is where I started to get off my bike to deal with my tire far too often. I filled it up with my Co2 and got on my way. I started up Yellow Jacket Canyon and boy was it sandy. The views of the La Sal Range were beautiful but this section will not be remembered for that. While climbing one of these short but steep sandy climbs I tweaked my IT band on my right leg. I had to get off my bike, stretch, down a few Advil, and rub on some pain cream. I took it easy on the rest of that climb. The Advil kicked in slowly as my thoughts of quitting on Highway 128 faded. Other then my tire and knee, I started to feel good that I was over half way done, and the hardest sections of the course were behind me. The section from Highway 128 was fairly un-amusing, besides the little bit of singletrack along the Colorado River. It was around mid morning when I arrived at the Cisco boat landing(mile 74). I started to notice more and more people around. I was exhausted at this point, but prevented myself from bonking by chowing down on Cliff Bars and Snickers. I was still not drinking a lot of water, but I knew I should, it was getting very hot. I stopped again to fix my tire. This time I attempted to take off my valve stem so I could put a tube in my tire. Not happening. The Stan’s sealant was working against me as it glued the valve ring to the valve threads. I filled the tire with some more Stan’s Sealant, and used up the last bit of my first Co2 canister and the first bit of my second and final canister. I was good to go…until I noticed my fork was not showing the correct amount of travel yet again. This same thing happened on the Arizona Trail Race earlier this spring. So I started to stress out a bit. I was certain Peter and Cat were pretty close behind as I kept stopping. My knee hurt, my rear tire was not holding air, and my fork was all messed up. I was increasingly going thru the mental ups and downs of the race. Self-supported racing is never easy, and this was a prime example. when the going gets tough, document it! After riding out the flattest section of the Kokopelli Trail, I reached the Westwater Junction (mile 96). Here I had two options: I could take a left to continue on the Kokopelli Trail or go straight (off course) to fill up on water. I decided the 4 mile detour would be a good idea, fill up on water rather then have another thing to worry about. I quickly filled up at the spigot at the Westwater Ranger Station. I got back on the road, where every car seemed to be in a big rush. The wind was blowing hard at this point and storm clouds started to build around me. I got to Bitter Creek Campground which was a welcoming sight to see so many people. I stopped again to fill up my tire. I was nearly out of Co2. I asked two very kind gents if they had an extra Co2 canister, luckily they had one that they may be willing to part ways with. They insisted I have it after I told them what I was doing. I felt confident I had enough Co2 for the rest of the ride. My fork was slowly losing more travel and all I was thinking about was getting to Rabbit Valley. Soon I hit the very familiar Western Rim Junction. A part of me felt like I was home, I was in Colorado after all. I had not seen more than 5 people from the start of Yellow Jacket Canyon and now I was weaving to avoid the congested trails on a Saturday afternoon. I was boiling hot, tired, and just wanted to stop pedaling for the day. I finally made it to the Rabbit Valley parking lot and knew I was on the final stretch. Why does the final stretch always seem to take an eternity? I burned through the road ahead knowing I have a lot of hike a bike ahead of me. I was still worried Cat and Peter were on my tail. I got to the singletrack portion that leads down to Salt Creek. I was on and off my bike making sure not to do anything stupid. I made it across the creek and started the long hike up Troy Built Trail, which took a long time. Lions Loop was next, which got a bit better, but still plenty of technical spots where I had to get off my bike. Finally, Mary’s Loop, it was the final stretch and I soaked it up. My rear tire was holding enough air, and people were staring at me like “why does this guy look like crap.” I reached the final downhill of Mary’s Loop and made my way up the road to the finish, looking back once more time for Cat or Peter. I made it to the top and did not pedal another stroke down to Lindsay and my car with 143.3 miles showing on my Garmin Edge. Although I did not finish under 15 Hours. I didn’t know how difficult this would actually be, and yes I dealt with a few unexpected situations. My knee being out of wack, my tire that probably got me off my bike for 40 minutes total, and my fork which has been very stubborn this spring. When it was all said and done I finished in 15 hours and 27 minutes. Lindsay was waiting for me with a huge Chipotle Burrito. I told myself at the end I would never do this trail again….now I can’t wait to beat 15 hours. At the beginning of the summer I committed to take part in the Kokopelli Trail Race. It was not much of a race with only seven people partaking in the event. It was still an adventure and I still pushed my limits. It was the second time finishing the trail this time from Moab, Utah to Loma, Colorado. Heres my write up on Westelkproject.com. Today I set off to Moab, Utah for the Kokopelli Trail Race Ride. Where a bunch of us biking idiots will set off at 12:30am (saturday morning) in route to Loma, Colorado. The 143 miles is mostly dirt road, with some paved road, and singletrack. Its not easy however with the roads being a mix of loose rock, ledges, and sand. not to mention the 17,000 feet of elevation gain. anyways whatever, its another unsupported race and boy are they fun/hard/dumb? So here is my gear list to not only share with you but to help me understand what I need. Ill Be using my 2013 Specialized Stumpjuper Comp Carbon 29er. With Time pedals and Maxxis Icons. If you would like to track me go here, I hope to finish some time in the afternoon on Saturday. If your interested in the route Check out 2pedal.com for the Kokopelli Trail Guide, and many other maps and guide books. A Crested Butte bike vacation, what you need to know. Year after year, Crested Butte, Colorado has seen an increase in summer visitors, for a number of reasons. The beautiful wildflowers, fantastic hiking/backpacking trails, amazing fly fishing, the Crested Butte Music Festival, the Crested Butte Art Festival, the historic downtown, and the amazing vistas. Crested Butte relies on the ski area and depends on the tourism in the winter, but when the snow finally melts off, the sweet singletrack offers endless fun for mountain bikers. Here is the info you need to know before you go. Crested Butte is tucked away in the beautiful Elk Mountain range in Central Colorado, It is roughly a 5 hour drive from Denver, and 3 hours from Grand Junction. Once you get here you my may never want to leave, trust me. There are two nearby airports if you are considering flying in. Montrose, Colorado is the more economical option but still and hour and a half drive once you land. Gunnison Airport is your other option and is located just 30 miles South of Crested Butte. If you do go through Gunnison, stop here and get your groceries at the City Market. If your driving in the summer months from Denver area, Cottonwood Pass will save you roughly 30 minutes, and is a spectacular drive. Mind you, it’s paved on the East side and gravel on the West side, but low clearance cars will work. When are the trails good to go? This question always depends on the weather. Every year is different because of the snow pack. Back in 2011 we were not riding any trails in Crested Butte until June, and those were the trails that were mostly south facing near the valley floor. Last year was completely different because of the lack of winter snow. It was mid April when I got on the Upper Loop. This year looked to be very similar to last year until we received 3 feet of snow in the month of April, and the snow has continued into May. Even with the snow, the Upper Loop and Lupine Trails are riding great. Historically, some trails such as 401 and 403 might not be ready to ride until early to mid July. The bike season can last as long as November depending on the weather conditions, but you can count on great fall riding through October. For the most up to date trail conditions check out the Crested Butte Mountain Bike Association Website or The Mountain Bike Hall of Fame Trail Report. If you have some time you should definitely check the Hall of Fame out. There is no shortage of places to get some good shut eye in and around town. Mount Crested Butte, home of Crested Butte Mountain Resort is located 3 miles up Gothic Road, past the town of Crested Butte. Here you will find most of the hotels in the area. Rates will vary depending on the date. The peak times in the summer fall between end of June to early August. The Grand Lodge is your most economical option and is few hundred feet from the base area. It includes indoor/outdoor pool, hot tub, a bike stand and hose, and outside bike storage. Bikes are not allowed in the rooms. The Elevation Hotel is a step up from the Grand lodge. It includes a indoor pool, hot tubs. and a very nice workout facility and spa. It’s located right next to the slopes with easy access to everything around the base area. Bikes are not allowed in the rooms but they offer a very convenient bike valet next to the front desk. The Lodge at Mountaineer Square is your high end condo style hotel. Some of the rooms could fit up to 10 people comfortably. The Lodge also has a nice indoor/outdoor pool area with hot tub and work out facility. It is located in between the Grand Lodge and Elevation Hotels. They also do not allow bikes in their units but they do have an indoor garage and secure bike storage room. To book online visit Skicb.com or call 800-810-7669 M-F 8am to 5pm. There are other property management company’s including Crested Butte Lodging and Peak Property. They will have on mountain and town vacation rentals available. Mt. Crested Butte Vacation Rental By Owner is another great resource for short term rentals. The Old Town Inn is the only “basic” hotel in town, but it has everything you need. The rates are very reasonable for being in town. They do have a hot tub but no pool. It is located right of HWY 135 just as you enter town on the left. The Inn at Crested Butte is a unique boutique hotel that offers high end service and amenities. It caters to wedding and large groups. It is located in the center of town, and is a close walk to anything. The Elk Mountain Lodge B&B has plenty of space for your big group and/or small group. You can stay in this historic building for just $103 a night during the summer. The Ruby of Crested Butte is your classic B&B style lodging known for their delicious breakfast. They are located on the East end of town but still very close to the main drag. The Crested Butte Hostel has a variety of room types including private rooms and bathrooms at very low rates. They also have the standard shared bunk rooms with shared bathrooms. Crested Butte RV Resort is starting it’s second summer in operation. It is located 2 miles south of town, and has RV electrical plug ins, restrooms, WIFI, and fishing options. Crested Butte Vacation Rental By Owner is a great resource for in town rentals. Crested Butte Lodging and Peak Property will also have town rentals available. This is a very popular option for bikers as it allows you the closest proximity to the trails and the views are spectacular. There are a number of forest roads that have both established camping and primitive camping. As always, if you are camping on National Forest the limit is 14 days. Kebler Road / Lake Irwin campground is a 7 mile drive west of Crested Butte. The established campground is located just alongside Lake Irwin and has some fantastic views. The large campground is open from June to September. There is water and bathrooms available, however it is expensive at $16.00 a night. The secret for this area is there are camp spots off the road just past the campground that are free of charge. If it is a weekend, be sure to arrive early to grab one of these sites. The best part of camping here is the Dyke Trail is out your front door. Once you pass the established campsite and parking area, continue on the road until you reach a fork in the road. Take a left at the fork and eventually you will see a sign that says Dyke Trail #838. Slate River Road has plenty of car camping options 2-3 miles up the road, starting with the popular Oh-Be-Joyful campground. If that is full, there is dispersed camping up the road, but watch out for warning signs of private land. There are no facilities up this road. The Lower Loop and Lupine trails are your closest options for singletrack in the area. For a longer ride, you can also access Gunsight Pass (jeep road up to the summit of Mt. Emmons) and 403 Trail via Slate d’huez. Washington Gultch also has dispersed camping 4 miles up the road. Make sure to look for private property signs before setting up camp. The 403 Trail is your closest trail but make sure not to park on the private land. Gothic Road has a small paid campsite a mile past the town of Gothic called Gothic Campground, this campground does have a latrine but no running water. Up the road there is plenty of dispersed camping as far as Schofield Pass. There will be signs saying where you can’t camp. The classic 401 Trail is just up the road at the top of Schofield Pass. There are two bikes shops in town. Both have great mechanics and can do anything from a fork seal replacement to bottom bracket bearing replacement to a standard tune. They also have great knowledge of the local trails and their current conditions. The Alpineer is located on 6th and Elk next to Griggs Orthopedic (which, by the way is your place to go if you get hurt.) The Alpineer is Crested Buttes outdoor gear shop. They carry everything from tents and sleeping bags to Men’s and Women’s casual clothes. The back of the store is their bike shop. They will have all your bike needs. Grips, tires, tubes, Co2, cages, what every you need they most likley have it. They also rent out Trek Fuels which is a perfect all around CB bike. Their Mechanics are great and their back parking lot has a self-service repair stand and tools. Big Al’s Bicycle Heaven is Located On Elk in between 2nd and 3rd streets. This is strictly a bike shop and a great one at that. They have plenty of bike apparel, gear, and hard goods for your long day bike adventures. They also rent out Kona, Rocky Mountain, Turner, and Felt bicycles. They also have a great variety of energy snacks and sports drink mixes. Their mechanics are some of the best around go check them out. The Mountain Express offers a free shuttle from town to the mountain. If you stay on the mountain (near the hotels I mentioned) you will want to get on/off the Mountaineer Square stop. If you’re in town, you have a few options, but the closest stop to all the shops and restaurants is the Old Town Hall. The Crested Butte Farmers Market is every Sunday starting in June from 10am to 2pm. It is located at 2nd and Elk. Here you will find fresh produce from the farms over Kebler pass, food venders, and art. Taste of Crested Butte is a relatively new event that offers special culinary experience from the best chefs in town. Also available is a the cocktail experience from the best mixologists in town. The event is held from June 19th through the 22nd. Crested Butte Bike Week, also known as the oldest bike festival in the world, is held June 26th through the 30th. The schedule is filled with events including the Chainless World Championships, a 24 hour townie ride, and of course the Fat Tire 40 mountain bike race. There is also a bike demo which brings in all the big names in the bike industry to show their bikes and gear. Crested Butte Music Festival is a prolonged festival from June 30th to August 11th. It usually consists of a classical music performance every evening of the summer, with smaller festivals within. Bluegrass In Paradise is July 6th and 7th, headlining this year is Sam Bush and Drew Emmitt. Crested Butte Wildflower Festival is the best time to enjoy the Wildflower Capitol of Colorado, especially this year as the spring moisture will sure benefit the native plants. From July 8th – 14th there will be workshops, hikes, tours, and events. Crested Butte Art Festival is the weekend of August 2nd. Elk avenue shuts down for three days for people near and far that come to display their artwork. After 40 years, the art festival has mastered perfection. Live entertainment, food vendors, and beer are available for you while you walk Elk Avenue all day. Alpenglow Concert Series is a free concert series in the town park of Crested Butte every Monday starting at 5:30 from June 24 to August 12th. There is a unique food and beer vendor every week. Live From Mt. Crested Butte is a concert series that takes place every Wednesday from July 10th to August 28th at the base area. Food and beer is available. Ginger Cafe is some of the best Thai and Indian food I’ve ever had. All of their appetizers are to die for and their Pad Thai, Thai Green Curry, and Kahadi are some of my favorite entrees. They prepare their Tofu very well so I always get a chicken/tofu combo. They also have some good drinks, namely the mango mojito, and a variety of beers on tap and by the bottle. West End Public House is my favorite hang out spot for many reasons. This Gastro Pub has some amazing food and excellent drink specials. The West End is unique because they smoke all of their meats, make there own barbeque, and grind there own beef in house. This is also one of the very few restaurants in town that makes everything from scratch. Their burgers are excellent and would say my favorite in town. They have many delicious entrees including the Fried Chicken and Waffles. They have a very large wine selection to complement a great staff who can suggest food pairings. Ask about the Shake-a-Day, you just might be a lucky winner. Secret Stash Pizza is on the move and not so much of a secret, as they have just recently moved to the Company Store located smack dab in the middle of Elk Ave. They will now be accepting reservations as they can accommodate more people. The Stash pizzas are very unique. A few of my favorites are the Notorious F.I.G, Mac Daddy (big mac on a pizza), Tahoe Bluze, and the basic Gertrude’s Veggie Delight. The Stash’s noted appetizer is their famous finger licking wings. There salads are also fresh and delicious. The Stash has plenty of drink options and hopefully they will have some beers on tap with their new location. The Last Steep is the “bar food” restaurant in town and much more. They are located in between 3rd and 2nd on the South side of Elk Ave. Their menu is easily one of the largest menus I have seen. To me their stand out item is the Jerk Chicken Sandwhich and their Fish Tacos. In the summer they also have a Build Your Own Bloody Mary Bar so you can personalize your bloody any way you want, and yes, there is bacon. You will not be disappointed with the Last Steep for you post ride eats. Pitas In Paradise is a tasty restaurant on the South East corner of Elk and 3rd. It is your place for a classic gyro, and all things pitas. There 5 choice soup bar, and hummus plate are just some examples of their appetizers, along with delicious salads and curly fries. They have plenty of drink options both cocktails and beers on tap. Brick Oven Pizza has decent pizza but they are mostly known for 30 unique beers on tap and large outdoor bar and seating area. They also have a salad bar and slices ready to go all day long. This is a great place to sit outside on Elk after a day of riding. Lil’s Sushi Bar and Grill is my go to Sushi option in town. There seafood is delivered 6 times a week and you can tell. There rolls are delicious. My favorite being the Cizz Roll but you will not be disappointed by the freshness and presentation of each roll. The most notable appetizer that they offer is the Dynamo Shrimp, crispy shrimp served with a sweet and sour sauce and chipotle mayo. Django’s is a Southern European influenced small plate restaurant with a very large wine selection. It is a little more on the pricy side, but the food is truly fantastic. It is located inside Mountaineer Square next to the bus stop. The Avalanche Bar and Grill is your place for burgers, beer, and friends. It’s fun atmosphere is great for the whole family, and they offer a family friendly menu. It is located just past Mountaineer Square, your sure not to miss the large brown building with the bright red awning. Montanya’s is our local rum distillery. They have a variety of obsessively crafted cocktails, and healthy snacks to choose from. They also have an old fashioned popcorn machine for free munchies. The Dogwood Cocktail Cabin is home to a wonderful atmosphere and a quaint outdoor patio. They offer decedent snack options as well as unique hand crafted cocktails. The West End Public House not only is a fantastic restaurant as mentioned above, but also a favorite for many to go drink after dinner. This pub atmosphere has great beers on tap, cocktails, and a very large wine selection. They have a late night happy hour from 9pm-2am, featuring $4 glasses of wine, $1.50 Pabst Blue Ribbon, $3 well drinks and $3 shots of Jim Beam. The best part is the game room upstairs. Kochevers Bar has just recently been bought and has plans of a snazzy remodel as well as having a food menu available. The Eldo Brewpub is the very small music venue of Crested Butte. Almost every weekend there is a cover for a better know band, usually every Friday and Saturday there will be live music. Some bigger names make it here a few times a year as well. They also brew their own beer. The Talk of the Town is a fun small atmosphere with reasonable prices. Your bound to run into a local here and they will talk your ear off. The Lobar is the other Sushi restaurant in town but when the sun sets it’s more of a club atmosphere. The Lobar has very unique seating areas for your whole crew. Every Thursday you will see many locals embarrassing themselves on stage during Karaoke. Can’t wait to see you all this year, safe travels and happy trails. For Maps of trails in and around Crested Butte check out 2pedal.com and Singletracks.com. The Arizona Trail Race is held every year in mid April. 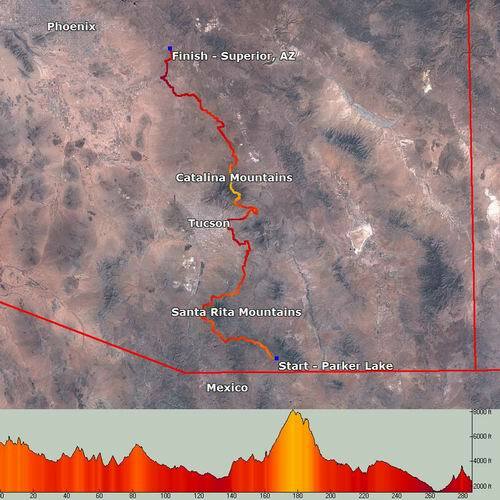 Its a self-supported bike race from Parker Canyon Lake to Picket Post Trail head In Arizona, roughly 300 miles. As a Rookie of the race, it took lots of planning and as much training as I could do here in snowy Colorado. Here is my experience shortened into a few words.